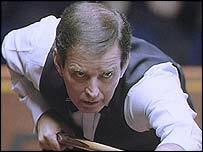 Snooker legend John Spencer has died at the age of 71 after a long battle against stomach cancer. The three-time world champion was a key figure behind the sport's big rise in popularity in the 1960s and 1970s. The Englishman, who won the world title in 1969, 1971 and 1977, was also the first winner of the prestigious Benson & Hedges Masters in 1975. Fellow great Ray Reardon led the tributes to Spencer, saying: "It's so sad. John was a fantastic player." Terry Griffiths, another ex-world champion, added: "Spenny was a special player who brought something different to the game. He was very well liked and will be missed badly. Ray Edmonds, another contemporary, said of Spencer: "He was a witty and cheerful character. "John was a professional's professional. I always thought he was the best professional, even in the 1970s when Reardon was winning all the titles. "Those two and Alex Higgins were the catalyst for increasing the game's popularity." Spencer, who became the first player to compile a competitive 147 break, was a former chairman of the game's governing body. After his retirement in the early 1990s, he became a respected television analyst for the BBC.